Using a pressure cooker, you can have this Green Chili Chicken Corn Chowder recipe ready in a little over 10 minutes. Or try our stove-top version to be completed in only 30-40 minutes. 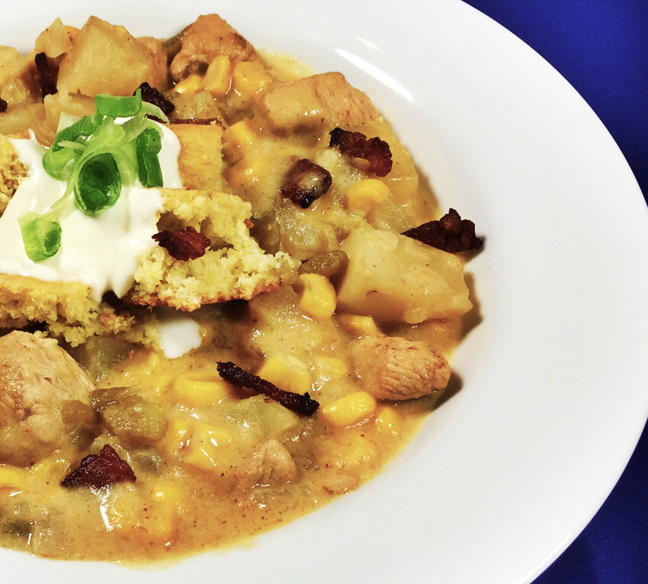 Easy and quick to make, the toasted cornbread croutons and bacon topping add a nice crunch to the creamy chowder. Place the bacon in a stockpot or pressure cooker pot over medium heat. Sauté until very crisp then remove the bacon to a paper towel lined plate; cool completely, crumble and set aside to use as a topping. Reserve 1 tablespoon of the bacon fat in the pot. Add the diced chicken with the ancho chili, 1/8 teaspoon pepper and a big pinch of salt and sauté until the chicken is browned on all sides, about 3 minutes. Remove from the pot and set on a plate. Add butter to the cooking pot. When butter is melted, add the onion and cook, stirring occasionally, scraping up any browned bits on the bottom of the pan, until tender, about 5 minutes. Add garlic and cook 1 minute more. Add chicken broth and stir, scraping up any remaining browned bits on the bottom of the pan. Add a 4 ounce can of green chilies, corn, diced potatoes and cooked chicken, with any juices that accumulated while resting, to the cooking pot. Stir to combine. Mix the cream with a tablespoon of flour, set aside. If using a pressure cooker; lock lid in place, select High Pressure and, after the pot has pressurized, cook 10 minutes. When time is up, remove the pressure cooker from the heat and do a quick pressure release. Stir in the cream. Add salt and pepper to taste. If using a stockpot, bring to a simmer, lower the heat, cover and cook for 30-40 minutes or until the potatoes are tender. Stir in the cream. Add salt and pepper to taste. Preheat the oven to 400 degrees. Cut the cornbread into cubes and place on a parchment-lined sheet tray. Bake 10 minutes until crisp on the outside, and the middles still soft. Serve the chowder in bowls. Sprinkle over the crumbled bacon, add a spoonful of sour cream and top with the chopped green onions.